Moskalkova seeks to ensure adequate conditions for Vyshinsky in Ukrainian detention | Russian Legal Information Agency (RAPSI). 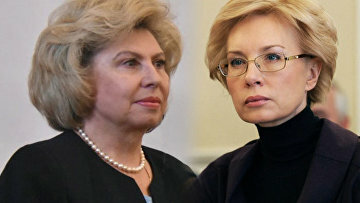 MOSCOW, March 19 (RAPSI) – Russia’s High Commissioner for Human Rights Tatyana Moskalkova has asked Ukrainian ombudsman Lyudmila Denisova to ensure adequate detention conditions for journalist Kirill Vyshinsky, according to the information published on the Russian ombudsman’s website. Currently, Vyshinsky is held in a Kiev detention center without electricity and artificial light. Moreover, the journalist has not been given needed bedroom accessories, including a matrass, except for a bedsheet, the statement reads. Such a situation has a harmful impact on Vyshinsky’s health condition, Moskalkova claims. According to the Russian ombudsman's press service, Moskalkova will take part in a forthcoming court hearing of the journalist's case. She will depart for Kiev on Tuesday.